The Royal Naval Aeroplane Repair Depot was commissioned at the Isle of Grain early in 1915, and to distinguish it from the seaplane station already established there it was named Port Victoria. Ultimately it became known as the Marine Experimental Aircraft Depot and undertook original design work. Its first entirely original design was the P.V.2 single-seat anti- Zeppelin seaplane. Of wooden construction and powered by a 100hp Gnome Monosoupape rotary, the P.V.2 was an exceptionally clean sesquiplane, the wing cellule being almost devoid of bracing wires with the upper wing attached to the upper fuselage longerons and the lower wing passing beneath the fuselage. The intended armament was a two-pounder Davis gun, although this was never fitted. 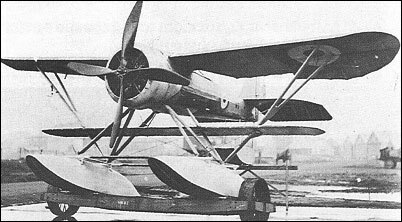 The P.V.2 was first flown in June 1916 with floats of the pontoon type, these later being replaced by Linton Hope floats. Trials showed considerable promise and it was decided to develop the design further as the P.V.2bis. If you will contact me I can give you the name and contact of a fellow modeller friend of mine here in the States that has a very successful FF electric powered PV-2 he campaigns in FAC power scale. Has won with it many times and surely has documentation for it.